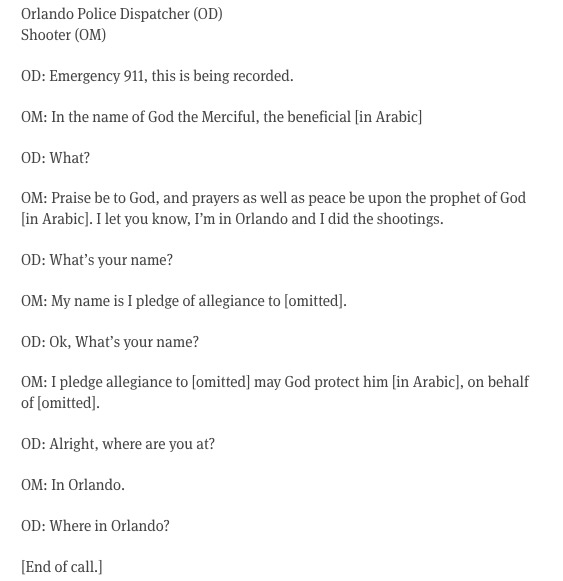 The FBI is facing backlash for redacting the names of the Orlando shooter and the group to whom he pledged allegiance in a transcript released of the conversations he had with police the night of the massacre. 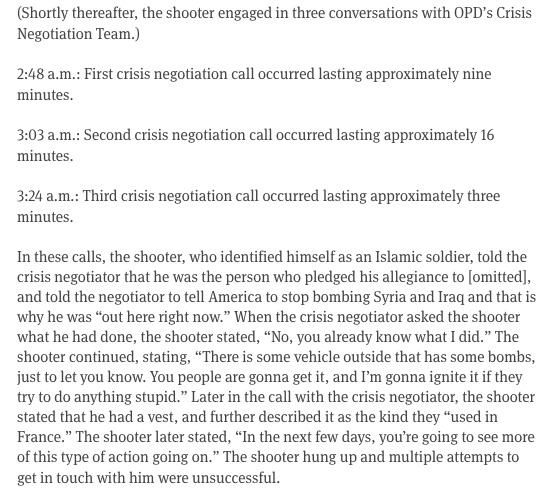 The gunman, who has since been identified as 29-year-old Omar Mateen, spoke to a 911 dispatcher and crisis negotiators as he carried out his attack, which left 49 people dead and more than 50 others wounded. In those calls, he pledged allegiance to the Islamic State and to its leader, Abu Bakr al-Baghdadi, FBI director James Comey said in a press conference last week. Assistant FBI agent in charge Ronald Hopper reiterated on Monday that Mateen was radicalized domestically and not directed by any foreign terror group. But critics have accused the FBI of trying to downplay Mateen’s sympathies for the extremist group by omitting its name from the transcript. 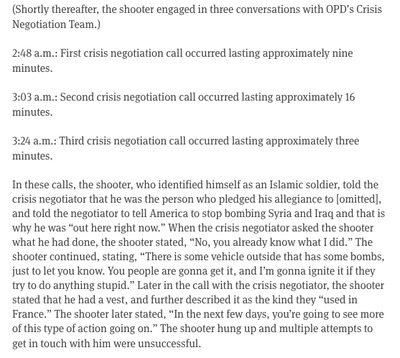 How foolish is the [omitted] Administration to have edits the transcript. I guess they don’t want to connect terrorism to radical [omitted]. NBC’s Chuck Todd on Sunday that the transcript would be “partial” and omit the group’s name. The FBI’s Hopper told reporters on Monday that officials believed including ISIS’ name would risk triggering people within the US “that might be like-minded” to commit similar acts. Mateen’s pledges of allegiance to ISIS and expressions of solidarity with the Boston Marathon bombers in the phone calls have been reported in the past and were confirmed by Comey in last week’s press conference. Mateen’s massacre on the gay Orlando nightclub, Pulse, on June 12 was the worst shooting in US history. Forty-nine people were killed and at least 50 more wounded. Mateen, who was a regular at the nightclub and reportedly used gay dating apps, was a security guard and had a Florida firearms licence that allowed him to carry concealed weapons. He was investigated twice by the FBI in 2013 and 2014 for his suspected ties to terrorists, but the cases were closed when authorities concluded that Mateen did not pose a substantive national-security threat.